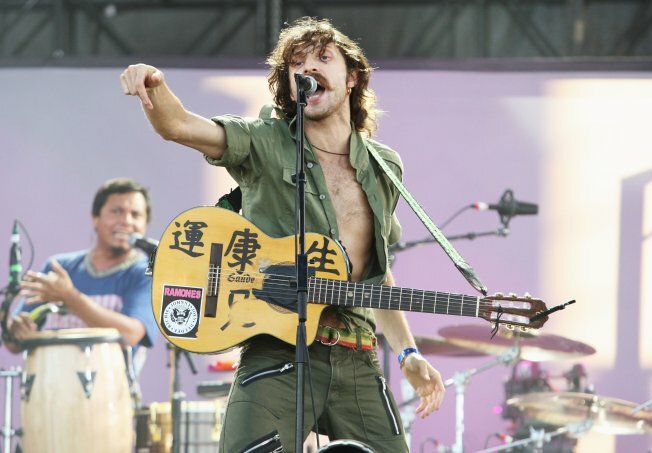 Eugene Hutz of Gogol Bordello performs on stage during the 2009 All Points West Music & Arts Festival at Liberty State Park on August 1, 2009 in Jersey City. The weather finally got it together on the second day of All Points West, which meant festival goers were able to enjoy all the branded amenities. In the absence of Friday's downpour, the MLB Batting Cage was in full effect, arts and crafts were poppin' at the Toyota Free Yr Radio tent and The Twix Misting Station was no longer redundant. Toss in beer gardens -- where they essentially fence in the drunks -- and it was like Kindergarten for Quarter-lifers. Singer-songwriter St. Vincent punched up frothy numbers like “The Strangers” and “Save Me From What I Want” with spazzy, reverb-laden guitar. The sight of the slight singer huddled on stage coaxing fuzzy chords from a comparatively large axe evoked a wide-eyed teen jamming in her bedroom. But ultimately St. Vincent and her genteel crew of multi-instrumentalists were an exceedingly capable festival highlight. Gypsy music collective Gogol Bordello pulled off a riotous mix of feverish fiddles, masked emcees and song-and-dance women led by shirtless frontman, Eugene Hutz. This year, main stage performances can be viewed live backstage in 3D which proved to be an amazing way to see a wine bottle-wielding Hutz flanked by his patchy gang of musical miscreants. Canadian electro duo Crystal Castles' set was plagued by audio problems and rendered Alice Glass' feathery wail virtually inaudible. While the crowd still thrashed about gamely to “Courtship Dating” and “Crimewave,” the nonexistent vocals paired with Glass' pallid skin and black ensemble came off like emo mime. But snaps to Glass for keeping on and hopping in the crowd to bellow the last few songs. Breakout Brits The Ting Tings shined with their energized pop. Bedecked in a glittery Lycra ensemble that screamed “Stevie Nicks Barbie,” Katie White worked breezy hits like “Great DJ,” “Shut Up and Let Me Go” and a short medley of 80s hits like Aerosmith's “Walk This Way” and the “Ghostbusters” theme. Tool fans who sat through hours of dance-pop anklebiters were rewarded as the group pounded out gruffly melodic metal anthems. Visuals from haunting music videos like “Schism” and “Stinkfist” swirled in huge monitors as the band knocked out hits from its nearly two decades in the game. Catch Coldplay, MGMT, Silversun Pickups, The Black Keys, Lykke Li and more during the final day of All Points West.